If you teach long enough, you’re bound to teach students from the same family. You walk into your classroom on the first day of school and do a quick double take at a familiar-looking face or name on your roster. The realization that you’re teaching a younger sibling can fill you with joy … or dread. 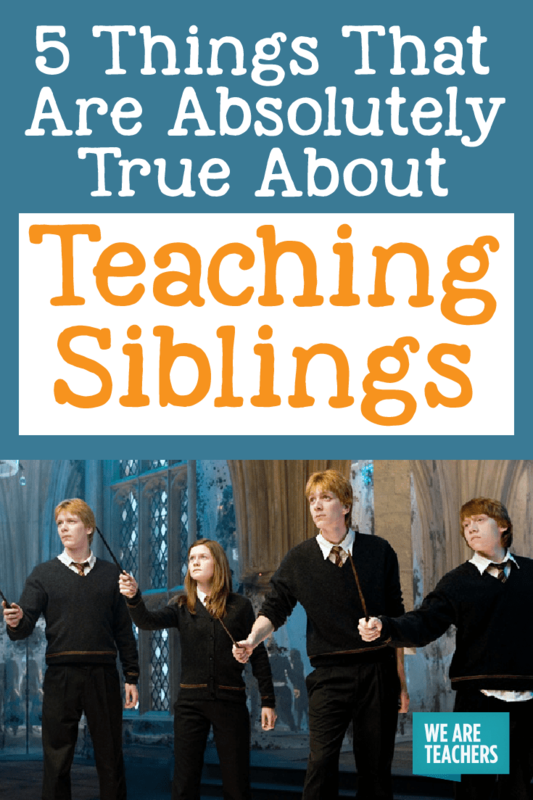 Here are five things that are absolutely true about teaching siblings. 1. Younger siblings will absolutely act just like their older siblings. It’s eerie when you see it, but younger siblings are absolutely like their older family members. The mannerisms, comments, work effort, and sense of humor will frequently have you doing double takes. It gets even stranger when you have three or four members of the same family who all act the same. Some are so alike, you’ll recognize them the moment they walk in the door. Siblings act absolutely alike. 2. Younger siblings will act absolutely nothing like their older siblings. You see a student’s last name on a roster, and you shudder. Their older sibling was nothing but a headache. They talked constantly. They were out of their seat every three minutes. You felt like you should just put their home phone number on speed dial. But the younger sibling ends up being nothing like their older counterpart. They are sweet, kind, and helpful. Their work is always done neatly and on time. They can be line leader without turning into a tiny dictator. 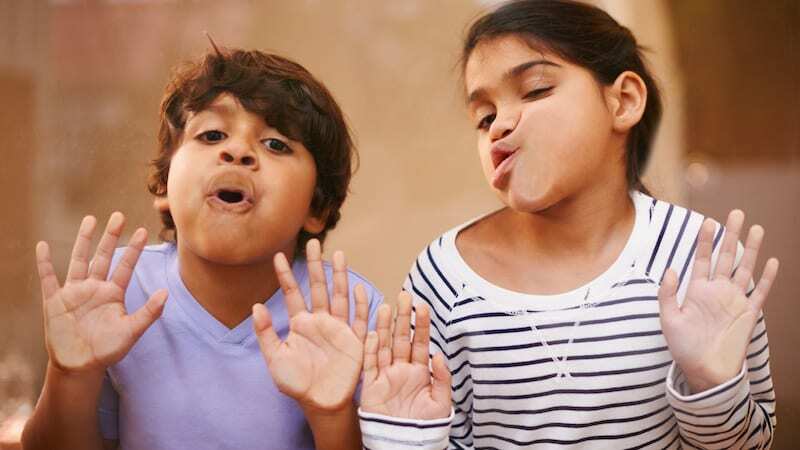 Siblings act absolutely nothing like each other. 3. Younger siblings will absolutely not want to be associated with their older siblings. You see the name on the roster, and as you move around the classroom in the first few days of school you say, “Are you … ?” Before you can even finish the student mumbles, “Yes, he’s my older brother,” in an embarrassed tone, and you know that the student would do just about anything to avoid being associated with their older sibling. In fact, it’s probably a good rule of teaching not to mention older siblings until you’ve gotten to know the younger sibling first. 4. Younger siblings will absolutely love mentioning their older sibling at every opportunity. Before you even look at the roster, younger siblings love letting you know that they are related to a student you’ve had before. They seem to worship their older sibling and want everyone in the building to know that they share DNA with them. While this can be a good thing if the older sibling was a stellar student and a kind friend to people in the building, if the student was an infamous troublemaker, you know you’re in for an interesting year. 5. There are absolutely zero rules when it comes to teaching siblings. So just sit back and enjoy the ride. All right, I fess up. There are no absolutes when it comes to teaching siblings. Some are like clones of their older siblings; others couldn’t be more different. Some love being associated with their sibling; some find being saddled with their sibling’s reputation uncomfortable. While it can be a blast to teach multiple members of the same family, it’s also important to remember to treat each student as an individual. That way, we get to know who they really are as a person and not just as a younger sibling. What have you found to be true (or false!) about teaching siblings? Come and share in our WeAreTeachers HELPLINE group on Facebook. Plus, check out things only teacher spouses understand.